NEW YORK, NY-Choosing steadfast reliability and high-performance capability, NYC-based David's Financial Corporation recently equipped its 20 high-volume check-cashing centers with Mitsubishi DX-TL910U and DX-TL2500U digital video recorders, providing valuable surveillance support in the financial centers located throughout the New York area. 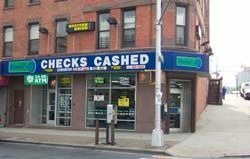 With new digital video recorders from Mitsubishi installed at 20 David's Financial Corporation check-cashing centers across New York City, the financial centers have valuable surveillance support that is reliable and easy to operate. The facilities are positioned across the region with stores in The Bronx, Brooklyn, Manhattan, and Rockland County. 17 store locations have each installed a Mitsubishi DX-TL910U DVR, a 9-video input DVR with built-in network. Greg Pagan, owner of NJ-based Digital Video Distributor, worked with David's Financial Corporation CFO Ira Krell to find the right security solution for the company. Krell knew his stores would benefit greatly by having a networked solution and was encouraged by the capabilities of Mitsubishi's line of DVRs. One feature of special importance was the multi-site feature that allows the viewing of all networked locations in any grouped preset. For example, David's can define a preset such as "Lobbies" and with the touch of a button all 20 lobby-camera views can be brought up on screen. The office would be able to not only view any suspicious activity, but can also monitor traffic flow in each location. "In addition to bringing its name brand reliability, Mitsubishi offered us a high-performance, yet easy-to-operate digital video recording solution," said Krell. "The straightforward performance, features and reliability of these Mitsubishi DVR units have been a valuable addition to our security strategy." Mitsubishi DVR technology is specifically designed to be user-friendly for installations like that of David's Financial Corporation. "We haven't had any problems with the systems in any of the 20 store locations," Pagan noted. "The easy-to-program user software is so intuitive, there is little to no training required for these units. That ease of use is important to an end-user like David's because it allows them to focus on their business of financial services, as opposed to becoming quasi-security experts having to know the ins and outs of DVR technology." The compact, yet durable DX-TL910U 9-channel DVR features a 250-500GB, built-in, hard-disk drive and a 60 picture-per-second record speed. Important for companies with several store locations, the DX-TL910U network port allows remote access to live and recorded images using a PC, saving time and resources. Also networkable, the 16-channel DX-TL2500U DVR features a built-in hard drive with up to 900GB of storage and flexible recording settings, allowing various recording speeds and camera settings for maximum recording performance.